Another Halloween is upon us which can only mean one thing; the Christmas mania starts in full force tomorrow. Aaaaaiiiieeee! This Halloween was a diversion from the normal routine of going to the Barrett's and trick or treating and celebrating Abby's birthday. I miss the chaos and taking the kids out door to door, frankly. Both of our kids went out with their friends' in other neighborhoods. Donna and I passed out candy to the 5 groups of kids that showed up. Strangely quiet. When I think about it real hard, this was a sad day. I'm certain it is Sarah's last trick or treat night. That means that my kids are growing up and the days of walking through neighborhoods with them while they beg for treats are over. While there were days that I wanted my kids to grow up and be independent, now that they are doing that, I want them to slow down. The empty nest is actually visible from here, and I'm not sure I like it. Sure we have several years left, but the days of snuggling with them, taking them to the park, playing in the snow with them are all but over. If this is what getting old is like, it kinda stinks. I want my kids to be a bit like Peter Pan where they stay an age forever. I'm not sure what age I'd like to order, but I don't think it's Teenage. (LOL). I carved the pumpkins for them today, or at least cleaned them out. Sarah did the detail work, while I did the slime removal. 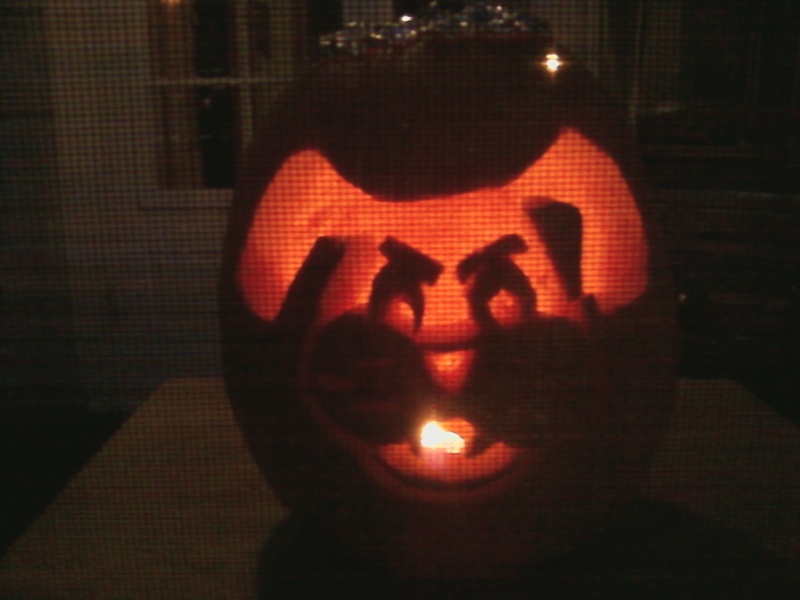 Donna said she thought that I needed to do the pumpkins more for me than the kids actually wanting to do them. In a way she's right. 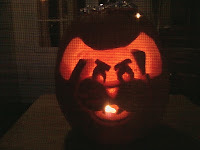 We always have pumpkins, so by golly, I was going to see to it that we did this year too. It's a weird traditionalist thing in me. I'll probably do a pumpkin when I'm 60 because I think it keeps you young, that kind of stuff. Gorging yourself on Halloween candy is also part of it, and I excel at that. M & M's were my thing this year, and my wrecked mouth is proof of it. Can't help this sweet tooth thing, I guess. A mellow Sunday around here. We're watching our friends' dog, Bentley. He's a good dog, but it's a bit like having an adopted two year old around the house. You have to school him on respect, boundaries and what he can and can't do. With our brand new carpet, it's been a bit of a vigilant watch for a leaky bladder too. No problems so far. I have to remember to let him out every hour or so though. Headed up to Madison on Wed. for EWUG (www.ewug.org) and some training for work. I hope to get some writing done in the hotel when I'm alone, but I've said that before, so we'll see. Hopefully I'll fit a post in then. When I look back on my life lately there are entire portions that I almost never think about anymore that bring great memories back to me. Much of these memories are brought back when a song from the period comes on my Ipod. It is weird how the brain works that way with song and memory and imagery. Amazing stuff, and I thank God for it. I am fearfully and wonderfully made.